Training af the neophyte started as early as 1911 with evening lecture sessions under K. Melas and Ath. Lefkaditis. Due to lack of roof and money to rent their own place, the first meetings were held at the offices of S.E.G.A.S. (the greek athletics association) at Panepistimiou street, next to the Athens's Club, during the evenings. Later, Kokos Melas (that -along with Ath. Lefkaditis- was the founder and the initial sponsor of the Greek Scout Movement) offered the semibasement apartment he lived in, at 7 Lycavittou street (the street has now been renamed to Amerikis), to be the movement's offices. The offices remained there for many years. 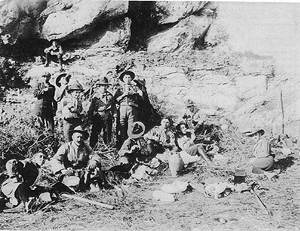 As early as 1912 the scout movement started expanding in the biggest provincial cities and gradually to every greek town. Meanwhile, the Boy Scouts started participating actively in commowealth and other activities. There was no fund raiser or benefaction, folk fair or sport event Scouts weren't asked to assist in organizing and watch over. The plantation of Athens and Attica region was established and kept up for a long period by the Boy Scouts under the guidance of the Ministry of Agriculture. In the beginning of 1913, Markos Mindler established the Sea Scouts Branch. Their base was primarily the "Royal Nautical Association of Neo Faliro". 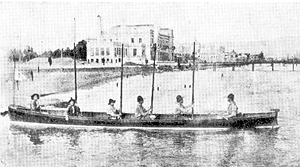 There, usage of the associations's boats and assistance of its athletes made the training of the Scouts of the Sea possible.